Soya Based Snacks / Starters Recipes : Starters / Snacks Recipes : Tarladalal.com. 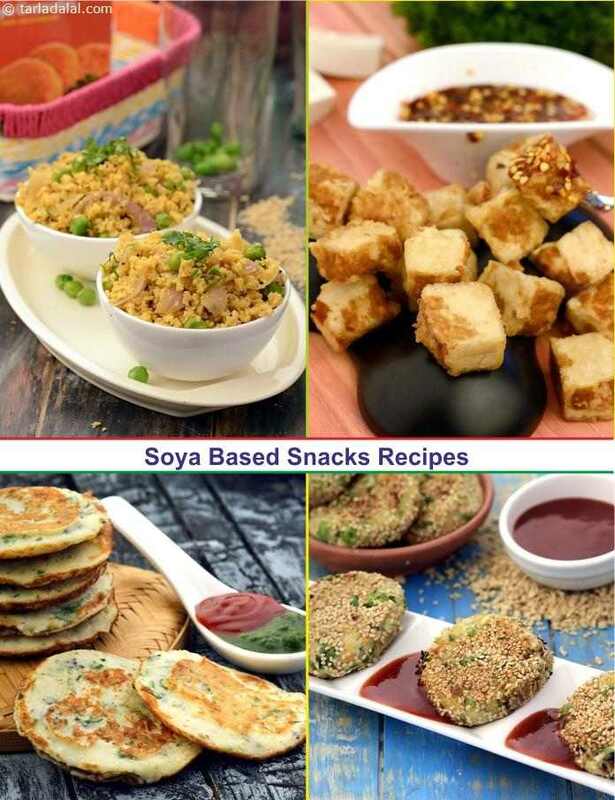 Snacks made using soya are a tasty way to give your body a protein boost! They can be had after gym, or if one wants to have something filling in the early evening hours. Enjoy the delectable flavour and wholesomeness of soya-based snacks like Sesame Soya Tikki , Quick Soya Uttapam and Soya Upma . These crisp, oil-free Khakhras will keep you going, right up till lunch. It abounds in all the nutrients except the fat, which is one of the culprits of acidity. Tasty and nutritious kebabes made with soya beans and other hot ingredients like chillies and condiments. A yummy snack and starter. North indian special. . . Soya kebabs! Add Soya Bean Cutlets in your evening teatime menu and perk up the protein content of your diet. Enjoy these cutlets made from soya granules and veggies with chutney or ketchup. For the soy bean cutlets the mixture is seasoned with spices and shallow fried. Serves best with tomato sauce. Veg Soya Kebab, soya and urad dal based kebab, deep fried and serve hot with green chutney. Green Moong Dal and Soya chunks are mixed together in besan paste with other spices and deep fried as snacks. Soya Dosas are high protein pancakes made from soya milk and wheat flour. This unusual dosa batter combination makes the soya dosa a healthier choice for breakfasts, especially for children. 2) this is a great healthy snack for afternoon and easy to make for mums! 3) feel free to marinate tofu in jaggery mixture if your child have better feel for sweet stuff. A yummy tea time snack made with Ragi Soya and wheat stuffed with veggies. Soya chana dal kebabs is a delicious and healthy preparation of soya beans and chana dal. Whip up this nutritive upma that is loaded with vegetables and is also much more nutritious than plain semolina upma. Easy to digest , good for diabetic patients. Soya Masti is a savory dish prepared from soya nuggets or soya chunks. The healthy soya chunks are stir fried with an array of dried spices, garnished with chopped coriander leaves and served with masala rice and raita. A nutritious main course or a nice tangy snack item.